Every organization has various processes of workplace politics that includes human interactions which involves authority and supremacy among the workers. It is considered as a tool to balance the diversity of majority parties. Sometimes it is influenced by an individual without regarding about the effect of the organization. When it is in groups then it is considered to be highly destructive. Office politics is denoted by the way the power is shared among people in the organization or workplace. It can also be defined as the way that affects the personal relationship among the people of same organization. Both individuals and groups may involve in office politics. It is considered as self serving or social groupings. Office gossip is different from office politics. In office politics people do it in the aim of gaining advantage. But office gossips is done by an individual to gain maximum advantage. It promotes positive environment and causes backstabbing. It makes one to act immediately. It tries to solve the anxious thoughts through direct conversation. Organizational politics deals with the competition of ideas and methods that helps in making decisions within any organizational structure. It generally refers to legislation and decision making within the organization. It reveals the lack of accord in the workplace. It specifies one’s effort in the organization with his/her own self interest to achieve effective goals. The organization deals with an individual work and interest of an individual. Politics is a profession of searching for troubles, finding whether the trouble exists or not and diagnosing it. It deals with unveil conditions, purposes, situations. The workplace politics are usually leg pulling and back biting. Ambiguous Goals are always confused with the conflict that is important for the employees on the organization. It cannot achieve the goals that are ineffective actions that enrage on the other side. It leads to conflict that changes situation unpleasant. Goal ambiguity has ineffective actions that regulate the outcome of other resources. Technology and environment plays a vital role in office politics. The economy of people is prone to credibility in which the organization’s rationalistic feeling affect the growth of the organization. It plays a significant role in the political structures. It is a goal setting stage of power. It is hospitable with familiar environments in business activities. The importance of the personality with the accumulation of motives and interests is an attribute of base power. Scarce resource has the pursuit of maximum sharing of resources, it deals with negativity. Even though the enterprise provides proper source for work, the employees will gossip about the organization and its related demand, supply and the allocation of resources. Non programmed decisions are the insular decisions, are the obstacles to an organization to achieve its goals. When improper decisions are made then the employee translates power into actions regarding opinion of an individual. The tactical options are the specific conditions which is more effective than a normal suggestion or decision. Organizational change leads to revolution within the organization. This pursuit of politics ends only when the organization is reorganized. It provides ample opportunities to the people when maneuvering. When reorganization is done the political behavior may change that involves certain circumstances. Legitimacy: It refers to the confidence level of the organization and the administrative functions that are not capable to establish effective organizational structure. Rational belief: It deals with the factual evidence and logical arguments that demonstrates, that the request is reasonable. Inspirational Appeals: It is something that deals with power, emotional feelings that attains targeted values, aspirations and hopes. Consultation: Increased targets and increased motivation requires one’s decision and plan for how to be accomplished. Personal appeals: It is basically depending upon the loyalty and trustworthy relationship. Pressure: It deals with the demands, target completion dates, and the warnings. Coalitions: It helps in enlisting of the people to attain the targets. It deals with reason of targets that are to be agreed. Employee who does not believe in hard work stick onto the nasty polices that takes care of their position in the organization. If the chosen leader is an unqualified person then the employees under him gains everything from his/her out of politics. It leads to nasty workplace and causes negative ambiance and unpleasant feelings in workplace. People who play office politics are unaware of their achievements and abilities. 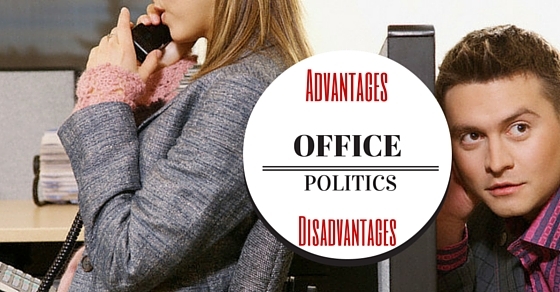 Office politics is a common fact in each organization. Management can boost the employees with the perfect morale, and direct about office politics in number of ways. The performance must be checked at the workplace which depends on the stress level of employee. Most managers discuss with the employee about their responsibilities in the organization. It becomes a framework for various organizational behaviors. Organizational behavior depends on the assumptions and commitment towards work by each employee. 1. Some people possess more power than other employees for the same organization and they influence through their hierarchy. 2. Getting promotion is most important for few people that creates competition between individuals and team objectives. 3. Decisions that will be taken are related to both work and personal factors. This creates conflict in the workplace. 4. To satisfy the need and objectives, people focus too much upon the competition. An effective way of dealing with politics is taking it in a positive way. One must try to accept the reality and must concentrate on learning the strategies of development in political manner. The information gathered here are to build a strong network to involve in. Who are the original leaders and whom does leadership belongs to? Who has the authority but not taking initiative to execute it? Who is the back bone of the organization? Who has anxiety and with whom? Who has the interrelationship and from where it originates? Are there any additional groups? Who are the champions of the organization? To build a smooth relationship one must be aware of the current relationship in the organizational tree. The individual must not be scared of politically powerful people of the organization. Instead try to establish link with them. He/she must be confident that the established relation is formal in all aspects of the hierarchy. They must start building relationship with the people who have informal power. To avoid empty flattery, one must build a trustworthy relationship and respect. Be a part of the network and must try to make friends. Office politics enables one to share his/ her tasks to other low level authority. If the task is distributed very often then he/she must think of the activities of others. Office politics creates morality among the employees with the increased delegation of concerned authority. It motivates the employee to work. It also increases the confident level of the employees. The employee will be aware of the care, caution and a valid approach towards work. This in turn results in increased efficiency and output. The efficient segment of the governing organization will have a legal recourse within the system. If it is the case, then the governing authority has to potentially violate the organization’s decision. When many people have different point of view and different ideas they must agree to the intellectual dynamism. One can strive to get a proper solution after the debate. Better coordination is when various activities and operations are set up within the organization or outside. This results in efficient completion of projects. Confidentiality is maintained without much cost and excess of trouble. One should strive hard to keep up the secrets of politics. Entrusted organization means the diversification of activities. It depends more on the new managers who gives new opportunities to the employees. It also gives effective and facilitated decisions. Using the network involves communication within the team and must try to avoid negative commentaries. It promotes the ability of team and helps the team members to have a clear idea on the organizational politics. Here are few ideas that an individual must keep in mind. Gain access to reports of the organization. Attract the opportunities where one can shine. Clarifying the ways with own team. a. One must not involve in things such as office gossips, judgments, rumors that are spread. These will never help in getting credits. b. Rising about the interpersonal conflicts. c. Always remain professional and act according to the organization’s interests. d. Avoid complaining and finding mistakes on others. e. Be a model to one’s own team and discourage politics. More cost is involved in the duplication of functions according to organizational chart. The recovery method cannot be adopted in small scale industries. It becomes difficult to distribute the workload among the different employees. When the politics and gossips go on around the organization, individuals find it difficult to concentrate on their assigned work. They are more interested in spoiling the image of others in front of the senior. Sometimes these office politics changes the attitude of individuals. Even a good performing employee will lose his/her interest towards the work. This will be an obstacle for him from meeting his requirements. Office politics increases stress that is cause of wrong information. If he/she has to maintain secrets then their stress level increases when the secret about this politics is leaked. Few employees will be demotivated due to decrease in their overall performance. Trustworthy friendship or relationship will be vanished. Due to mere politics, sometimes the employee may fail to receive the awards given by the organization. Thus the result of office politics will be more disgusting. Managers and employees who look forward will be on the safer side. In the corporate world, it is advisable not to make long term relationship with the coworkers which might put oneself into trouble. In office politics the informal power acts more than a formal power.